As anyone who’s visited a dispensary can tell you, there are a myriad of ways to consume weed. So, for those of you new to cannabis, we’ve prepared a short introduction to the various preparations of the plant. Bud is the literal flower of the cannabis plant. It contains all those lovely cannabinoids and terpenes that give cannabis its therapeutic and psychoactive effects. Bud is typically smoked. It can also be vaped, although vaporizers that can handle flower tend to be a bit more technologically advanced, and pricier. 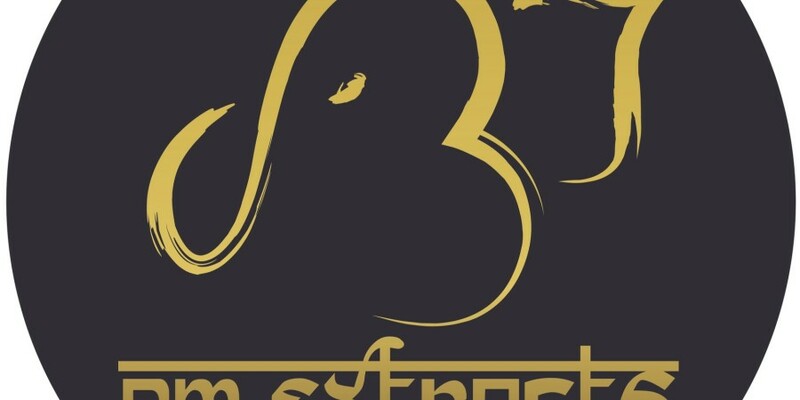 What are its effects like? 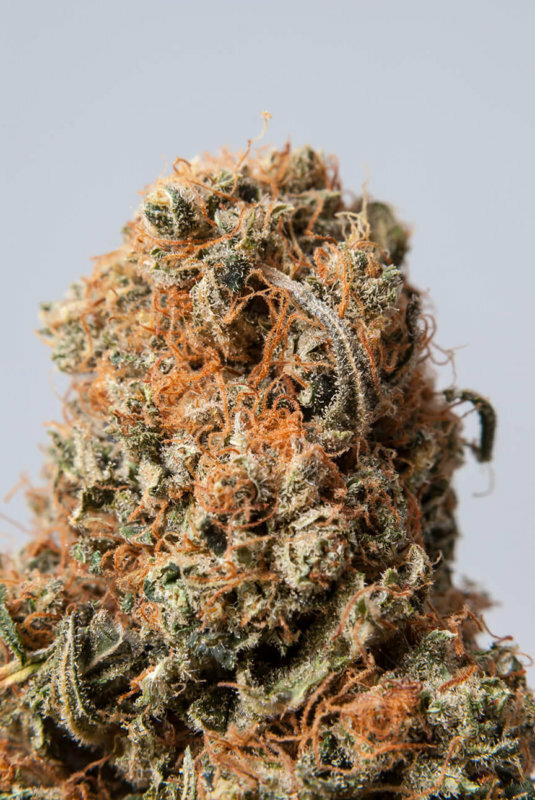 When bud is smoked or vaped, the onset is almost immediate. You should begin to feel the effects of flower within 30 minutes at the longest. 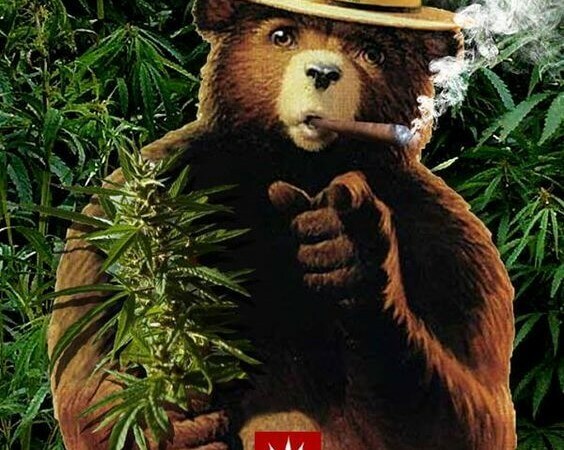 However, bud is generally not as potent or as long-lasting as extracts or edibles. Your high should be mellower, and should not last for much more than two hours. 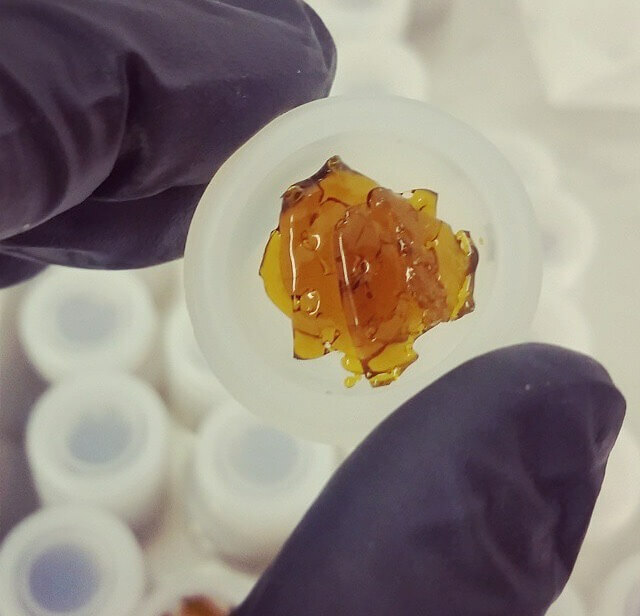 Extracts, also called concentrates, are a product produced when solvents strip away much of the cannabis plant itself, leaving behind high concentrations of cannabinoids. Concentrates can be produced using a variety of solvents, from butane to carbon dioxide to ice water. 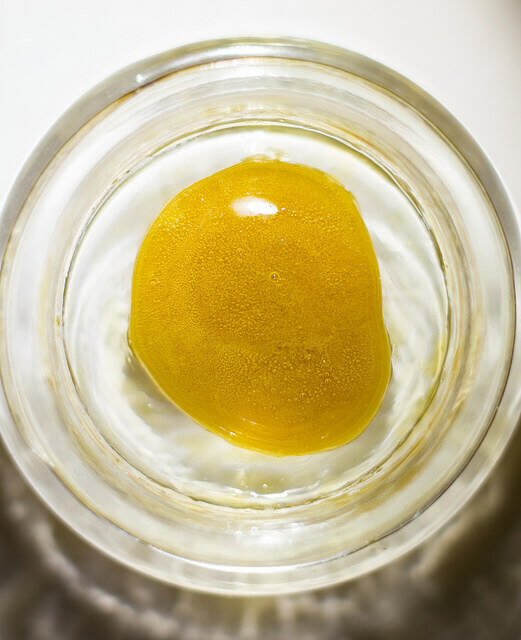 They also come in a variety of consistencies, from hash, to shatter, to wax and more. Topicals are also a type of extract. They are applied to the skin, however, and produce no psychoactive effects. Rather, they are usually used for treating localized pain and inflammation. 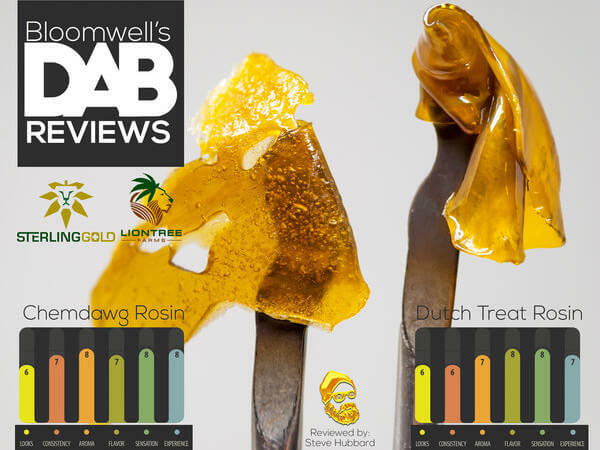 Extracts are usually consumed using either a dab rig or a vape pen. A dab rig looks and acts something like a super-charged bong. 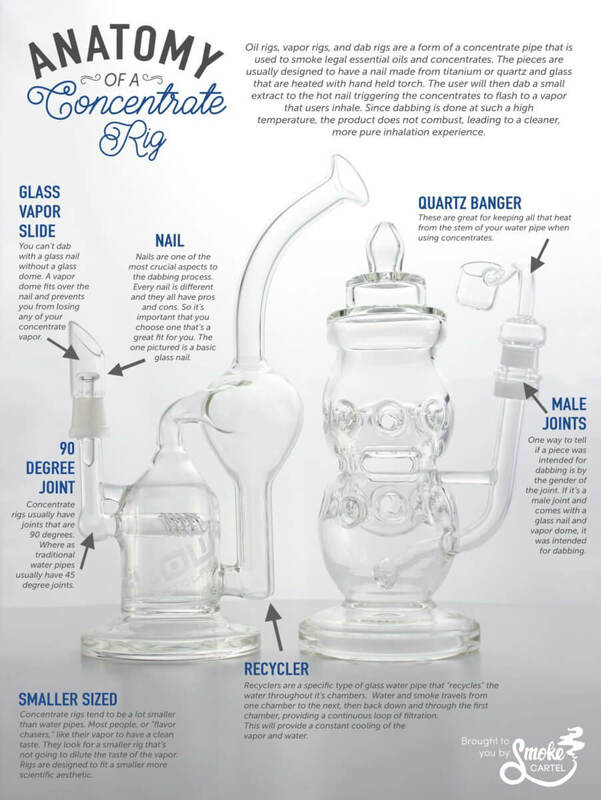 ‘Anatomy of a Concentrate Rig’ (also called a ‘dab rig’) from www.smokecartel.com explains the apparatus used for dabbing while many vape pens intended for concentrates come with refillable CO2 oil cartridges. What are their effects like? Because extracts have such high concentrations of cannabinoids, they tend to be extremely potent. While it is relatively easy to control your high by sipping on concentrate in a vape pen, dabs tend to get even the most seasoned veterans quite stoned. Similar to flower, onset should be near immediate. 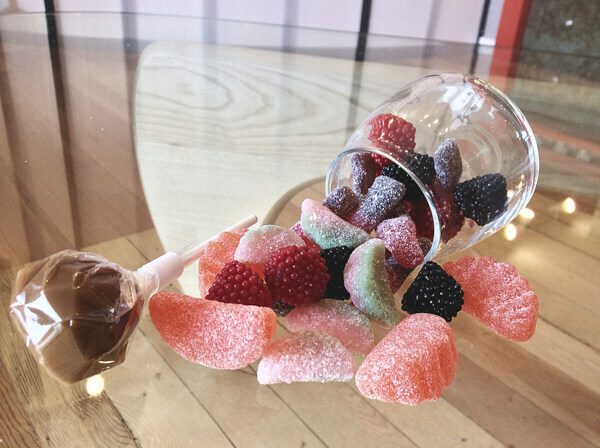 Edibles are cannabis-infused food and drinks. They come in a variety of forms, from savory snacks to tasty beverages. To consume an edible, simply eat or drink it. Edibles are extremely potent, and, to the surprise of many first time users, slow to take effect. For this reason, we always recommend starting low and going slow until you get a handle on your appropriate dosage. Just how long edibles take to set in depends on the kind you are consuming. Those consumed sublingually, such as tinctures, lozenges, and hard candy, take effect relatively quickly, usually around 15 to 30 minutes. Gastrointestinal edibles, such as savory snacks, baked goods, and most drinks, can take up to about two hours to reach their full effect. Medical cannabis is processed for administration in various ways; fresh, dried, and cold/heated extractions (or concentrates). In this session of the Substance Cannabis Class, we will be covering the different forms of cold and heated extractions. Kief: Powder of the trichomes that have fallen off the plant. May be ingested raw but is usually smoked on top of flower buds or ingested in cooked edibles. Slurry: Extraction using olive oil or alcohol. Usually ingested raw. Hash: Extraction using cold water and ice. May be ingested raw, smoked or used in cooking. Variety names reflect differences in the proportion of plant material to trichomes and how the variety reacts to heat. Bubble = initially bubbles when exposed to heat. Full bubble = continues to bubble throughout the heating process. Melt = melts or turns into gooey oil when exposed to heat. Full melt = almost pure trichomes; fully melts when exposed to heat, leaving little or no residue. Honeycomb/Crumble = dry, crumbly texture; often has small holes like a honeycomb. Budder = more viscous, consistency like butter. Shatter/Glass = consistency similar to hard candy. Sap = sticky texture similar to honey. Taffy = firmer than sap but not brittle like shatter. Tea: Extraction into hot water and then drunk. Tincture: Heated cannabis that is extracted in alcohol. Usually administered directly under the tongue (sublingually). Edible: Extraction into a fat (butter, oil) and then used in cooking food. Oil: Slow heating of cannabis in olive or coconut oil. Usually used in food or topically on skin. Salve/Cream/Lotion: Low heating of cannabis oil with beeswax. Used topically on skin. Marijuana tinctures are liquids that are taken sublingually under the tongue. Tinctures are alcohol extractions or glycerin infusions of cannabis flowers and trim leaves. Tinctures contain all of the essential marijuana plant oils, or cannabinoids. Until cannabis was banned in 1937, tinctures were the primary type of cannabis medicines. Marijuana tinctures address the problems of rapid medicine delivery and consistent dosing. The medicine is rapidly absorbed into the arterial system and is quickly transported to the brain and body. Usually, a tincture dose is delivered by means of a medicine dropper or a teaspoon. Titration or dose control is easily achieved by the number of drops a patient places under the tongue. A rule of thumb on dose is that patients receive benefit from 5-7 drops to a couple of full droppers depending upon the potency of the tincture and the patient’s own unique requirements, among other factors. Absorption by the arterial blood supply under the tongue is completed in seconds or minutes. Experimentation with dosage control is quite easy to achieve with a little attention and practice. If swallowed, absorption will occur more slowly in the GI tract. Many patients add tincture to a cup of tea or cranberry juice for easy delivery. When tincture is used in a beverage, absorption will be slower than if absorbed under the tongue. While tincture absorbed in an empty stomach is accomplished in minutes, conversion in the liver remains, as does the difficulty in titrating dose. GW Pharmaceuticals has performed clinical trials and is marketing a sublingual spray in England that decreases muscle spasticity. The company has recently applied for clinical trials in the US for a product that minimizes severe epileptic seizures in children.